During this festival held in the ruins of a soccer stadium in Zurich, a living room comes into being in the entrance corridor of the former stadium. 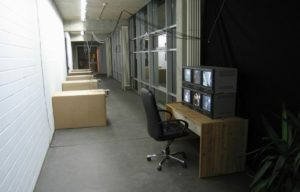 In this living room, an old television screens historic video interviews made in the 1980s on the streets of the Swiss German cities of Zurich, Basel, and Bern. 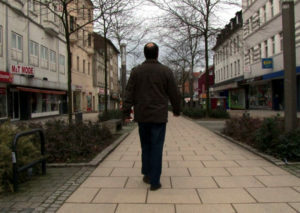 During the interviews, passers-by comment on squatted houses of these times – sometimes in a positive manner, sometimes hostile. The interviews are part of a documentary produced at that time by the squatters themselves and come from Swiss Social Archives in Zurich. Insects such as spiders, grasshoppers, flies, and a praying mantis are inside board game boxes. 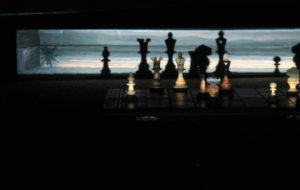 Isolated from the environment, they are projected on the three different board games, which lay abandoned on the ground. Five people live in five boxes. 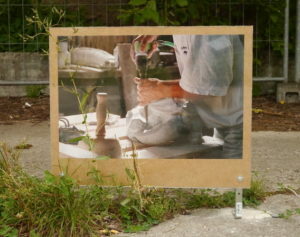 They are filmed while they do their everyday activities. Long cables connect cameras with a panel of screens on which the spectator can see what is happening inside the boxes. 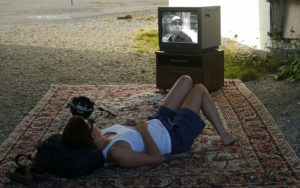 The spectator is filmed as well, and can see himself on a sixth screen.